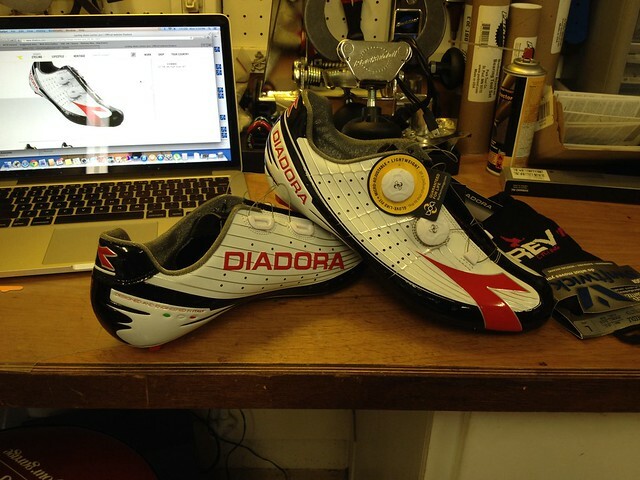 I am very excited to do a product review on the new Diadora Vector Pro Cycling shoes. A few quick notes I wear a Specialized S-Works, Suplest a Switzerland company, and Shimano. I am also wearing a Diadora Vector Pro 45. Right out of the box the fit and finish was extraordinary! The stitching work was immaculate. The upper is made from large panels to minimize seams. The insole supplied is a throw-away insole. I use a Specialized insole. I replaced it immediately. There are a few good days of riding in this next week I will report back after a few hundred miles. This entry was posted in product review, Shoes by REV Cycling Directeur Sportif. Bookmark the permalink.